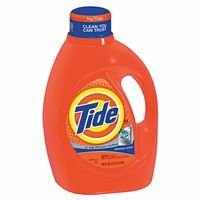 Tide HE Liquid Laundry Detergent, Original Scent, 100 oz, 64 Loads, Sold as 1 CA by Procter & Gamble at Blog Free Here. MPN: 522697. Hurry! Limited time offer. Offer valid only while supplies last. A low-sudsing detergent that provides great cleaning performance in high efficiency machines. Contains more cleaning ingredients, less water.